Living overseas, especially in the Middle East, might lead you to think that picture-taking-Santas skip this region. But luckily, you would be wrong… sort of. As our oldest daughter was two-and-a-half last Christmas, we figured it might be the first year she’d start to “get” the idea of Santa and Christmas, and ironically enough with the help of her Jordanian nursery school, we were right! Suddenly she was recognizing Santa’s image everywhere! Grocery stores, malls, billboards, books; for weeks everything was, “Santa!” yelled with great glee and accompanied by lots of pointing. I’m not certain exactly what they told her about him in school, but they made darn sure she’d know him by sight. The previous two years we did the obligatory pictures-with-Santa thing. Her first Santa was a gorgeous stand-in at Harrod’s in London. We’ll just skip over the whole spewing vomit all over the Disney princess wing of the store the day before, leading us to sneak in the back entrance the following day and keep our heads down as we paid our entrance fee to Santa’s fantasyland. But a picture was captured, bemused at best, sans vomit, so all was good. By year two, we were in Jordan, and we gladly took part in the pictures-with-Santa opportunity provided by my husband’s employer. This photo captured the tears and screams of a confused 21-month-old. No fault to Santa himself, he tried. So, next comes year three. And in addition to a Santa-seeking toddler, we have the twins’ first Christmas, so I was feeling some pressure to capture the moment. As we did the previous year, we signed up again to have pictures with Santa at my husband’s job. But when photo day arrived, we had a toddler and one twin dragging with fevers of 102, so we nixed it. This suddenly left me with the need to find Santa in Amman. I reached out to friends on Facebook and was given a few leads. Santa had been spotted at the mall, at Hamleys toy store, and even at Marriott. Great! So many options. I started with the mall. I wandered the whole mall, all levels, looking for the “Santa scene.” You know, the big chair, the backdrop, the festive accoutrements. I found what I thought might be it, but it turned out to be a car display. Then I found a large sign stating “Santa’s Village” but there was nothing there but an oversized present and a huge Christmas tree. So I went to the Information desk, figuring they’d know the big guy’s arrival dates. I asked this young Jordanian, “Where is Santa?” He looked at me with such cavernous blankness I could almost hear the ocean. “For pictures? … Pictures with Santa?” Still nothing. He may have blinked. I thanked him for his “help” and wandered off. Next attempt was to hit Hamleys. I had heard that Santa would be appearing at “all” Hamleys. So I visited one of the smaller branches. There were two very nice employees who said that Santa wasn’t there; the store was about the size of my kitchen, so that fact was fairly obvious. But then they took the initiative and called the main store. After a lengthy conversation, I was told he was going to be at the Abdoun branch tonight from 5:00-6:00pm. In addition to posing for photos, the kids could also do a craft and would I like to reserve some spots? I said no to the crafts, but yay for Santa. So I called my husband at work and asked him to get home by five o’clock so he could help us with our little motley crew. We got everyone all dressed up. The toddler was in her red velvet dress, shiny black shoes, white tights, two little puff pigtails and excitement oozing out of her. The twins were equally festive, in a red Christmas dress, and a blue sweater with tan pants, though being six-months-old their enthusiasm was notably less. Hubby was home on time, so we loaded everyone up and headed out! “No, he wasn’t. He was supposed to be here from five to six!” Yes, my refute was ridiculous, but you get three-under-three all dressed up with nowhere to go and see how you feel. The next day I sat down and studied the brochure from Hamleys; which included a local book store, a grocery store, a home goods store and Hamleys (gosh, the guy certainly gets around). According to this, Santa was at the book store at the mall in two days at 5 o’clock, and then later at Hamleys (with Barbie, for some reason). However, feeling mild annoyance at the incorrect information we’d received before I was not overly enthused to return to Hamleys, so I decided to try out other options. According to various Facebook postings, Santa had been seen at the Marriott downtown and at another mall. Still wary of Hamleys, I opted for the Marriott as my next venture. I called first, spoke to a lovely gentleman who told me Santa would be available for photographs tonight as well as caroling. Yay! So, re-dress everyone, load them up, head on out on a dark rainy night. Locate the Marriott, stroller out, car seats in, carry the Bean, enter through security, smile with delight at the gingerbread village and trains, admire the large sparkling tree, get obligatory pictures and then start to wonder, "Where was Mr. Claus?". 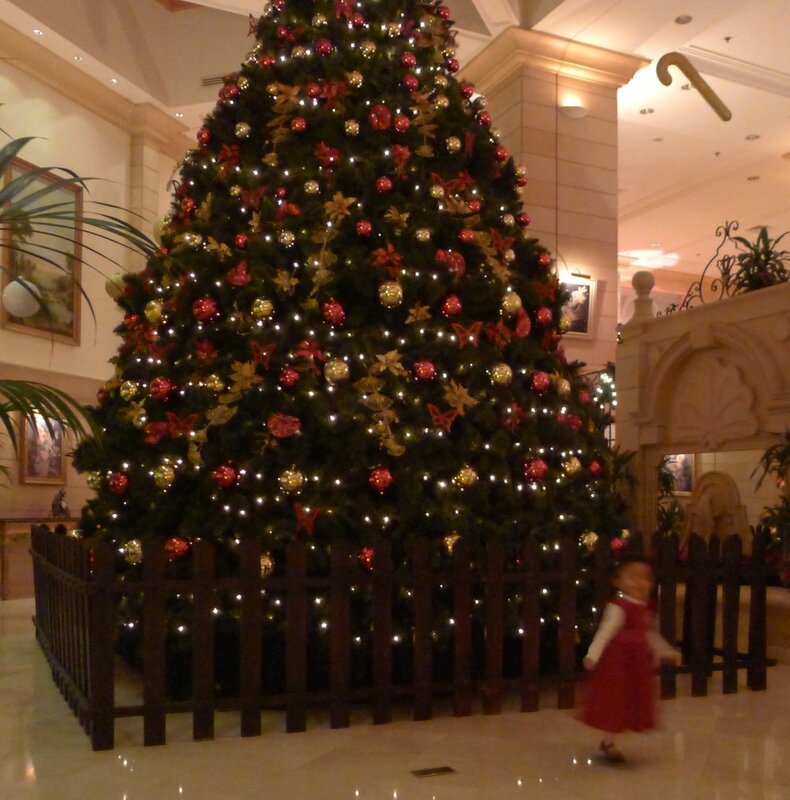 We wander a bit through the lobby, looking for signs or lines of happy holiday-clad children. Nothing. Maa fii, indeed. So I wander up to the happy clerk at the reception desk and smile with all my might and ask, “Where is Santa?” “Oh, he’s not here tonight.” Silence. Smile fades. Apparently Mr. Claus wasn’t feeling well, got lost, forgot his schedule, who knows. Bottom line, fifth attempt to see him; fifth "Maa fii Santa". Okay, so I was running out of options here. Hamleys it is. Re-study large colorful brochure. Figure out he’ll be at the Hamleys on Mecca Street, so I call just to confirm; “Yes, Santa will be here Tuesday night at six o’clock.” Great, see you then! December 23, not like we’re cutting it close or anything. Re-dress three children, re-load into car, re-corral husband from work, head out yet again on a dark drizzly night. We arrive just after six, expecting to see lines of excited children, gleeful parents, and a jolly old St. Nick himself. We saw nada. There were certainly children, and there were plenty of parents, but everyone was milling about and yet again, Maa fii Santa. So we inquired, “He’ll be here soon,” we were told. An hour later, we were still waiting but now had two tired and hungry babies, so we prepped the bottles and started feeding. The Hamleys staff, for all their Santa ignorance, were very kind and got chairs for us and entertained Bean with bubble guns (that were coincidentally for sale right there). Waiting continued. Finally we knew he was coming! How?!? Because the sound of bagpipes filled the air. And I mean, filled it; loudly. A parade of tall Jordanian-looking festive elves came marching through with bagpipes, drums, and great revelry followed by the great man himself, Mr. Claus. It was so “festive” (i.e., loud), that Bean and Sprout both burst into tears. I practically did too, but out of relief not anxiety. Once the music finally ceased, the line formed and we dragged our crew to the end of it. By the time it was our turn for a picture, Bean and Sprout were calmer but certainly not in any frame of mind to be passed off to Santa or happy elves. So we passed off Rocket (who was just bemused by the whole thing) to the drummer elf, Daddy held Sprout and I held Bean and I handed my camera to yet another elf and we all got in the (damn) picture! In the end, the picture was one we’ll probably never show to anyone (yeah, it’s that bad). But at least we got it, right? So for the next year I’m setting limits right now. Unless your fever reaches 104 and you’re spewing Harrod’s-worthy vomit, we’re seeing Santa at our first chance! Merry Christmas, everyone!